Introduction. One of the objectives of the Bologna Declaration of 1999 was the adoption of a system of easily readable and comparable educational degrees, to promote mobility of students and teachers, and thereby to facilitate employability in the common European labour market. Aim. The aim of the research was to assess the career plans of dietetics students from different European countries, as well as to evaluate whether ? being future members of the common European labour market ? there is a demand and willingness for international mobility. 12 from Belgium, 11 from Turkey and 5 from Poland. Results. Beyond the ?classical? fields of dietetic activity (dietetic consultation/health promotion, clinical-therapeutic dietetics), the students would prefer new fields of dietetics, such as: health tourism, sports diet, food industry, commercial catering, research, etc. 70% of the students would work as employees (in state institutions, administration or in the commercial, civil and ecclesiastical sphere), and 30% as independent dietitians. 54% of the students would try to find or accept a job abroad. They believe that their acceptability abroad could be assisted by a compatible and mobility-ensuring educational system and by more effective professional foreign language courses in the home land. Conclusions. In dietetics education, students should be prepared for job mobility, according to their needs, with information about the underlying possibilities of the two-cycle educational system, about healthcare systems and dietetics work of foreign countries, and also, with more effective professional foreign language teaching. Key words: Bologna Declaration, education, dietetics students, career orientation, European employability, job mobility. In order to create a common European labour market, member states agreed a common goal to lessen the differences between professional educations. To achieve this objective, in the Bologna Declaration of 1999 they affirmed the need for co-ordinating higher educational policies and to establish the European area of higher education by 2010 (1, 2, 3). Among the main objectives of the Declaration were the adoption of a system of easily readable and comparable degrees, the introduction of the two-cycle system (BSc and MSc), and the promotion of widespread student, teacher, researcher and employee mobility, which will have a positive effect on the development of the connection between higher education and innovation, research and development factors (1). Dietitian professionals quickly realized the possibilities inherent in the Bologna Declaration, and the European Federation of the Associations of Dietitians (EFAD) worked out international guidelines of dietitian education, the European Academic and Practitioner Standards for Dietetics, or, as it is commonly referred to, the European Dietetic Benchmark Statement (EDBS), in order to ensure that dietetics students attain the same level of professional skills and knowledge in every country. The guideline emphasizes the development of the dietitian profession and the raising of academic and professional standards, it defines the unified competencies and requirements of the dietitian profession, and it provides a practical model for the member states? curricula and course developments (4, 5, 6). Co-ordinating the dietitian educational requirements among the countries makes a dietitian qualification competitive not only at the domestic level, but also at the European labour market level. Besides gaining knowledge about dietetics students? career orientation and mobility plans, in this study we also aim to evaluate whether they have enough information about the international acceptance of their qualifications, and whether they feel prepared for undertaking work abroad. We also conducted a survey about the needs which may arise during their preparation for entering the European labour market. Students from BSc programs of dietetic faculties of several European universities (two from Hungary, one each from Belgium, Turkey and Poland) took part in the study in the 2009/2010 academic year. We asked participants to complete a questionnaire available online on the server of the Faculty of Health Sciences of Semmelweis University Budapest in Hungarian, Polish and English. The questions were focused on the students? intentions for their career and mobility, and their preference for employment at home or abroad; the questions also evaluated the students? 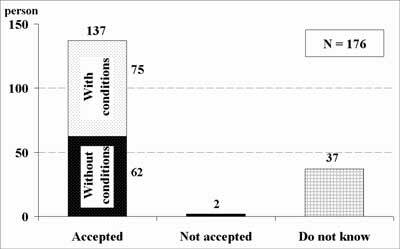 knowledge of the international acceptability of the dietitian qualification. For five questions there was only a Yes or No answer, four questions provided multiple choice answers, and the opportunity was also given to form a personal opinion. In the present study, we processed answers arriving until July 7, 2010. The questionnaire was completed by 177 dietetics students, 149 from Hungary, 12 from Belgium, 11 from Turkey and 5 from Poland. Because of the numerical preponderance of Hungarian students, the study cannot be seen as representative for the whole of Europe. Out of the participants, 38 students were in their final year, 33 in their third year, 24 in their second year, and 46 in the first year of studies; 36 students did not indicate their graduation status. Data processing was conducted by the descriptive statistics method with the Excel program. As seen in table 1, beyond the ?classical? fields of dietetic activity (dietetic consultation/health promotion, clinical-therapeutic dietetics), the students would prefer new fields of dietetics, such as: health tourism, sports diet, food industry, commercial catering, research, etc. Table 1. Fields of work chosen by students. As for the employment status, 70% of the students would work as employees (in state institutions, administration or in the commercial, civil and ecclesiastical sphere), and 30% as independent dietitians (see figure 1). Fig. 1. Choice of employment status. To the question whether they would try to find or accept a job abroad, 54% of the participants said yes, 19% would not work abroad, and 27% cannot decide so far whether they would work abroad. Table 2 shows that in their intention of working abroad students are mainly motivated by financial considerations (26%), desire for gaining professional experience (22%), and language learning intentions (21%), etc. Table 2. Motivational factors of undertaking work abroad. We also asked about the country of their choice for work after graduation. With regard to Europe, the first, second and third countries in order were the UK, Germany, and Austria (see table 3). Table 3. Six most frequently chosen countries of work abroad (number of votes). Figure 2 shows how well students are informed about the acceptability of their degrees in other European countries. 78% (137 students) are well aware of the fact that the degree is accepted, 21% (39 students) are not informed about this, and only 1% (2 students) believe that the degree would not be accepted, and they have to graduate again abroad. Fig. 2. Students? awareness about qualification acceptability. No were in their final year of studies). 20% of the respondents cannot assess their own professional preparedness. Among the 121 students who feel professionally prepared, 79 are afraid of language difficulties. In table 4 we summarized the topics that, according to the dietetics students, would facilitate their employability in the common European labour market. According to surveys by EFAD and the International Confederation of Dietetic Associations (ICDA), more than 60% of dietitians work at hospitals (4, 5, 6, 7). Therefore, to a certain extent it was surprising to learn that only 16% of dietetics students would decide to work in hospitals. Obviously, new fields of dietetics such as health tourism, sports diet, food industry, commercial catering, research, etc., have become more popular. Similarly, it seems that there is a shift in career orientation regarding the employment status of the dietitian as well: the majority would still work as employees, but for about 30% of the students self-employment is more attractive. Half of the respondents (54%) would take the chance of free mobility within the EU. However, the main motivation for movement to the Western European part of the EU is the higher financial and moral acknowledgement, while professional challenge seems less important. Students supposedly choose their countries of destination also in accordance with their foreign language skills, which is traditionally English and German, at least regarding dietetics students from Hungary. Their desire to learn Spanish, Italian and French is a new and positive trend in the career orientation. For students who do not wish to work abroad, the main causes are fixed professional career plans, or family ties to the home country. Nearly one fifth of the students do not know yet whether they would take the opportunity to work in another country of the EU. More than one fourth do not have enough information about their degrees? acceptability abroad. If so, the possibilities inherent in the Bologna system should be communicated to students when they start their BSc training and the information should be deepened during their dietetics studies. Regarding these and similar topics, the educational and career consultant services of the universities (career offices) are of utmost importance (8). Only two thirds of the students (68%) feel professionally prepared to enter the pan-European labour market. Regarding the others who do not feel prepared, it should be made clear whether this insecurity comes from lack of language or lack of professional knowledge. The fact that even some students in their final years do not feel ready for working abroad because of professional reasons should be taken seriously because it questions the quality of educational training. Although European dietetics education at higher educational level should first of all meet the manpower demands of the home country, the Bologna system of education meets the expectations set up by the unified European labour market as well. Students are aware of the possibility of mobility and it is their just claim that the education they receive should prepare them for this. To meet students? expectations, greater emphasis should be given to the continuous development of education. The students should be informed about foreign countries? professional work and healthcare systems as well. A basic condition for this is appropriate, high level professional foreign language knowledge and promotion of both students and teachers exchange. /educ/bologna/bologna.pdf. Downloaded August 10, 2010. 2. Csekei L: Közös európai válasz a közös európai problémákra: a Bolognai folyamat és az Európai Felsőoktatási Térség (Common European answer to common European problems: The Bologna process and the European Area of Higher Education) Felsőoktatási Műhely 2010; I. 9-22. 3. Barakonyi K (ed): A Bologna ?Hungaricum? ? Diagnózis és terápia. (Bologna ?Hungaricum? ? diagnosis and therapy.) Új Mandátum, Budapest 2009; 40. 4. European Academic and Practitioner Standards For Dietetics. (or: European Dietetic Benchmark Statement.) Assembled by the EFAD, June 2005. http://www.efad.org/everyone/1117/5/0/32 Downloaded August 10, 2010. 5. Middelton C, Lawson M, Soerensen M, Hadell K: Education programs and work of dietitians in the member countries of EFAD. Report. 2003 http://www.efad.org/everyone/1107/7/0/32 Downloaded August 10, 2010. 6. The education and work of dietitians (2004) International Confederation of Dietetic Associations (ICDA) http://www.internationaldietetics.org/ Downloaded August 10, 2010. 7. Dietitians around the world. Their education and their work (2008) International Confederation of Dietetic Associations http://www.internationaldietetics.org/ Downloaded August 10, 2010. 8. 2005. CXXXIX. Law about higher education 46 § (3), 125(1).